Artists play a crucial role in our perception of the world. Artists can show us something vital we do not see in our reality, therefore, they try to reach us through their artworks. They show us what is hidden beyond the curtains through the prism of the history that is being lived in their paintings for infinity. Artists express their emotional state, character and attitudes through their artworks. Artists have always been making huge contributions to the world’s development, preservation of history, and cultural heritages. They speak to our consciousness so that we must always seek for the truth, thus defending human dignity when it is not respected and recognized and when human rights are violated. On October 31st, during my WYA Europe internship, I had a great chance to visit an exhibition called “Beyond Klimt. New Horizons in Central Europe, 1914-1938”. The exhibition took me to the end of World War I and the Austro-Hungarian Empire through the eyes of Gustav Klimt, Josef Capek, Egon Schiele, Oskar Kokoschka, László Moholy-Nagy and 75 other artists living during this period. These artists believed and expressed themselves through their artworks that try to influence the world, politics and society. Some painters take us to the heavens in taking our breath away with the beauty of their paintings. At the same time, they bring us down to the earth by forcing us to see something more than just beauty. As Joseph Pieper said in CTP Chapter 5, “Long before a creation is completed, the artist has gained for himself another and more intimate achievement: a deeper and more receptive vision, a more intense awareness, a sharper and more discerning understanding, a more patient openness for all things quiet and inconspicuous, an eye for things previously overlooked”. This precious painting is called “Waterfall”. It was painted by Helene Funke in 1922. 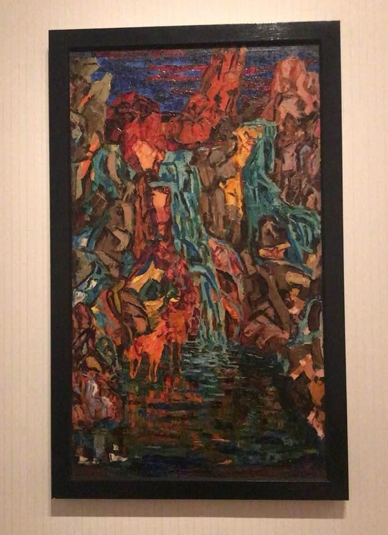 I believe “Waterfall” truly reflects what Joseph Pieper was trying to explain by saying that the “Capacity to perceive the visible world “with our own eyes” is indeed an essential constituent of human nature”. Gustav Klimt was an artist who loved painting nature and portraits, especially portraits of women. He felt beauty with every part of his soul so that he could transfer this feeling into beautiful paintings. He saw the beauty of women in all its external manifestations. Some of the paintings of Klimt, where he was portraying women naked, were considered too frank and against morality. But Klimt himself was trying to escape vulgarity. By depicting the bare body, he was trying to show sensitivity and the natural beauty of women. 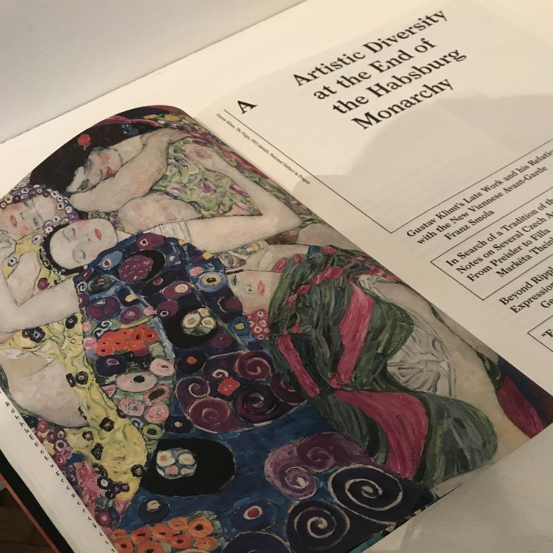 However, Gustav Klimt was not concentrating only on this way to show the beauty of women, this was just a part of his vision. He was seeing the beauty of women in all its appearances. 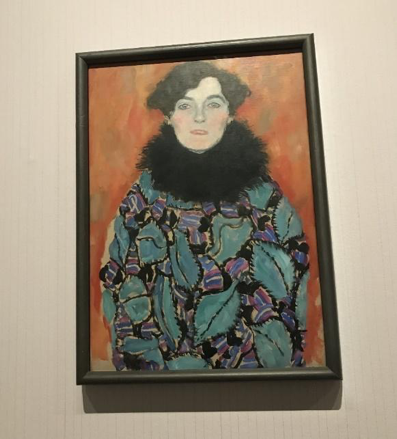 The above portrait “Johanna Staude”,the first painting you see when you enter the exhibition, was painted by Gustav Klimt in the last year of his life in 1918. Looking at this portrait, we can feel the beauty, elegance and grace of this woman, whose name was Johanna Staude. Gustav Klimt had been dedicating himself to the feeling of the beauty until the end of his life. 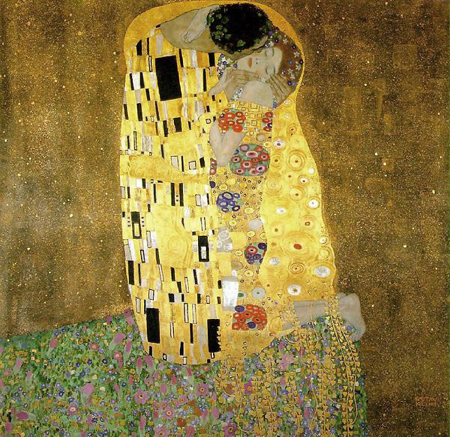 Even though Gustav Klimt’s most famous painting is “Kiss”, it’s nowhere to be seen at the exhibition. Beautiful and tender “Kiss” was painted during Klimt’s Golden period, 1907-1908, and the exhibition focused on years 1914-1938. That gave me an opportunity to get a better insight into some less famous, but not less precious works of Klimt and other artists. 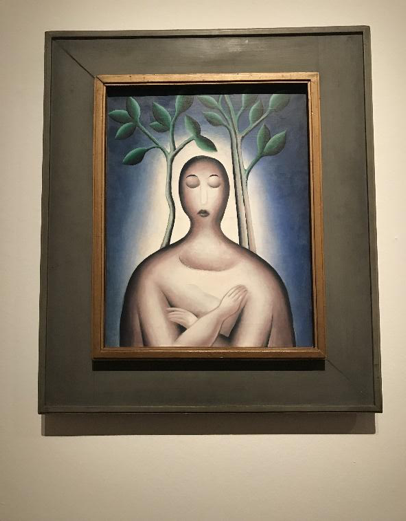 At the exhibition, this precious painting called “Meditation (Prayer)” by Jan Zrzavy (1915) took my attention. It reminded me of the words from Joseph Pieper in CTP Chapter 6: “We work so we can have leisure. And leisure is an activity meaningful in itself.” And Jan Zrzavy could reflect this through his painting. You can feel the soul equilibrium and harmony of the human meditating in this painting. During the World War I many artists had to to serve in the War but some artists could stay and be involved in art due to their ineligibility for military service (like their age or gender). After the end of WWI, many artists started painting again and organizing exhibitions. 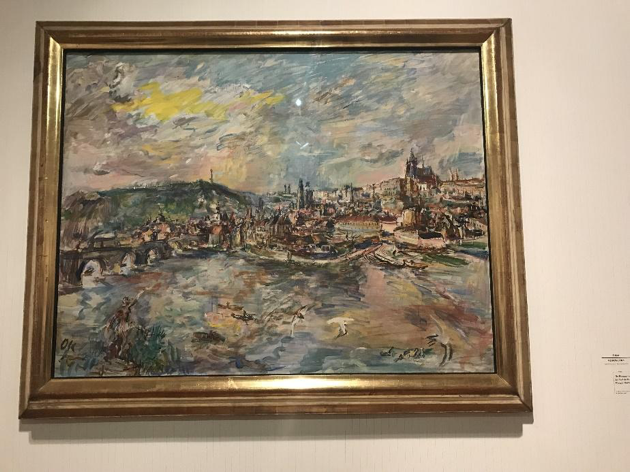 Some artists were continuing to develop Expressionism, an artistic style created before WWI. Expressionist artists sought to express the meaning of emotional experience rather than physical reality. After the end of WWI, some expressionist artists continued to develop their interpretation of Expressionism. 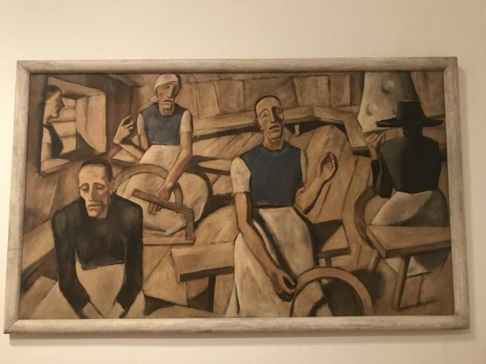 Some expressionist artists changed the aggressive emotionality of the pre-war Expressionism to an analytical, investigative choice of subjects. They started to paint the reality of the World War I. 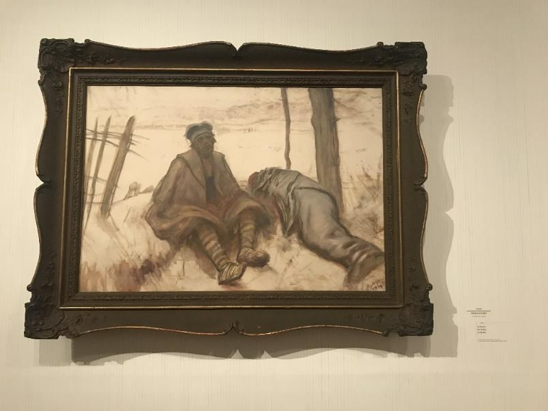 This painting called “Dead Soldier in Barbed Wire” was painted by Robert Angerhofer in 1920. He was trying to show the horrors of war, how war devalues the human life and worth, how dignity and rights of humans were violated the most terrifying way. 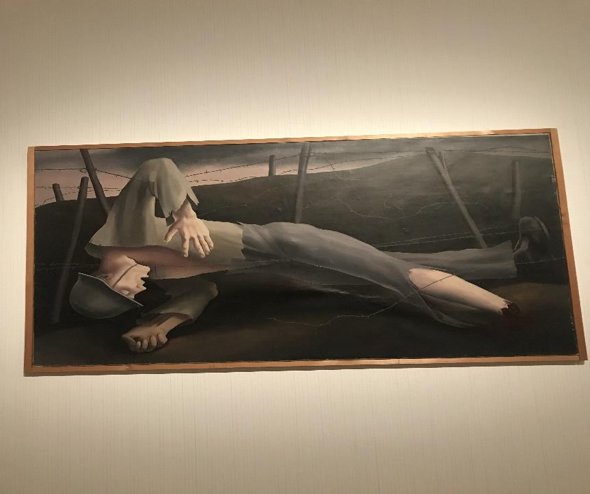 It is impossible to look at this painting without tremor, fear and pain for this poor soldier and knowing that he was not the only victim of the war. Laszlo Mednyanszky painted “In Serbia” in 1914, showing us the stark ruthless reality of the war. Albin Egger-Lienz painted “Women of War” in 1918-1919”, trying to show how much pain war brings to all people, including women. You can feel the emotional death of these women when you look at the painting. War is death, if not physical, then emotional. Artists convey the history of the world through their artworks. Through their artworks, we can travel in time and experience life in that time through their eyes. Through art, we see where and how human rights were violated and how human dignity was unrecognized so that today we may learn from these lessons from the past. Written by Kasiet Kapalova, an intern at the WYA Europe office in Brussels. What is Beauty? Intervention of Mafalda at the European Arts Forum 2015.